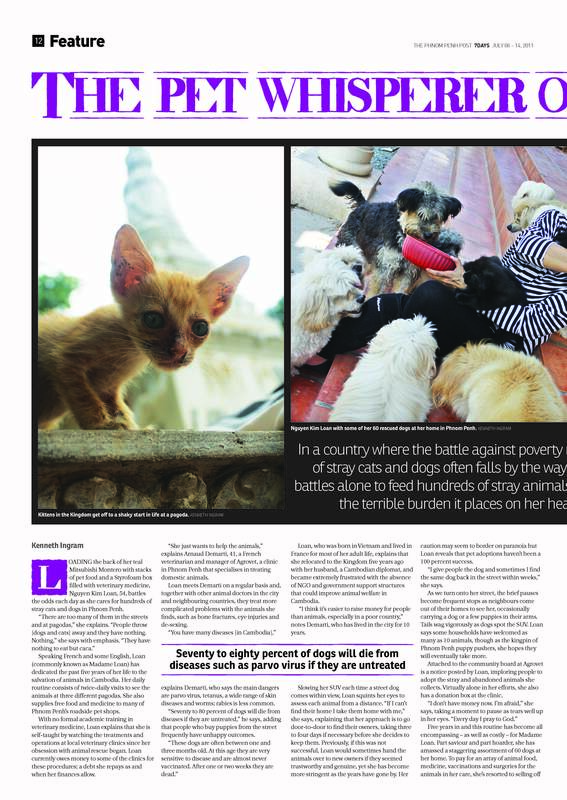 In a country where the battle against poverty rages every day, the fate of animals around the city often falls by the wayside. But one woman battles alone to feed hundreds of stray dogs and cats despite the terrible burden it places on her health and finances. LOADING the back of her teal Mitsubishi Montero with stacks of pet food and a Styrofoam box filled with veterinary medicine, Nguyen Kim Loan, 54, battles the odds each day as she cares for hundreds of stray cats and dogs in Phnom Penh. Speaking French and some English, Loan (commonly known as Madame Loan) has dedicated the past five years of her life to the salvation of animals in Cambodia. Her daily routine consists of twice-daily visits to see the animals at three different pagodas. 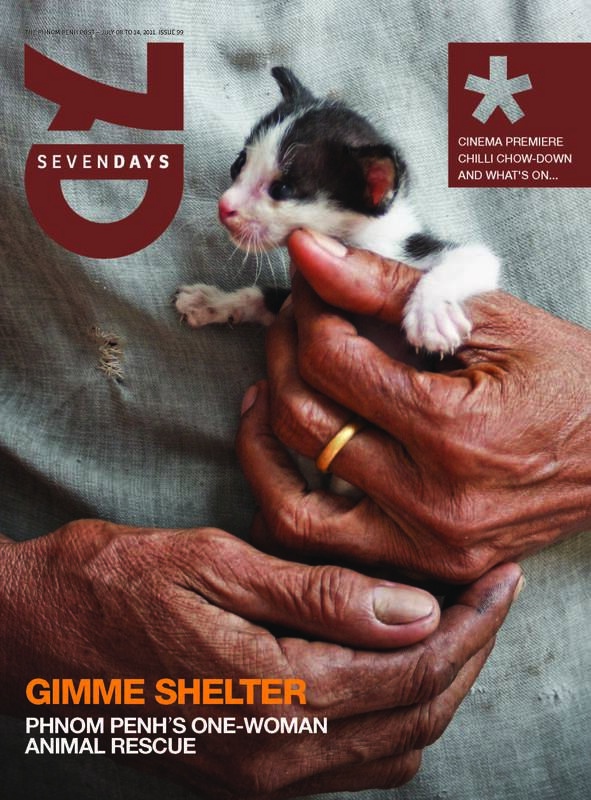 She also supplies free food and medicine to many of Phnom Penh’s roadside pet shops. With no formal academic training in veterinary medicine, Loan explains that she is self-taught by watching the treatments and operations at local veterinary clinics since her obsession with animal rescue began. Loan currently owes money to some of the clinics for these procedures; a debt she repays as and when her finances allow. “She just wants to help the animals,” explains Arnaud Demarti, 41, a French veterinarian and manager of Agrovet, a clinic in Phnom Penh that specialises in treating domestic animals. Loan meets Demarti on a regular basis and, together with other animal doctors in the city and neighbouring countries, they treat more complicated problems with the animals she finds, such as bone fractures, eye injuries and de-sexing. “You have many diseases [in Cambodia],” explains Demarti, who says the main dangers are parvo virus, tetanus, a wide range of skin diseases and worms; rabies is less common. “Seventy to 80 percent of dogs will die from diseases if they are untreated,” he says, adding that people who buy puppies from the street frequently have unhappy outcomes. Loan, who was born in Vietnam and lived in France for most of her adult life, explains that she relocated to the Kingdom five years ago with her husband, a Cambodian diplomat, and became extremely frustrated with the absence of NGO and government support structures that could improve animal welfare in Cambodia. “I think it’s easier to raise money for people than animals, especially in a poor country,” notes Demarti, who has lived in the city for 10 years. Slowing her SUV each time a street dog comes within view, Loan squints her eyes to assess each animal from a distance. “If I can’t find their home I take them home with me,” she says, explaining that her approach is to go door-to-door to find their owners, taking three to four days if necessary before she decides to keep them. Previously, if this was not successful, Loan would sometimes hand the animals over to new owners if they seemed trustworthy and genuine, yet she has become more stringent as the years have gone by. Her caution may seem to border on paranoia but Loan reveals that pet adoptions haven’t been a 100 percent success. “I give people the dog and sometimes I find the same dog back in the street within weeks,” she says. As we turn onto her street, the brief pauses become frequent stops as neighbours come out of their homes to see her, occasionally carrying a dog or a few puppies in their arms. Tails wag vigorously as dogs spot the SUV. Loan says some households have welcomed as many as 10 animals, though as the kingpin of Phnom Penh puppy pushers, she hopes they will eventually take more. Attached to the community board at Agrovet is a notice posted by Loan, imploring people to adopt the stray and abandoned animals she collects. Virtually alone in her efforts, she also has a donation box at the clinic. “I don’t have money now. I’m afraid,” she says, taking a moment to pause as tears well up in her eyes. “Every day I pray to God.” Five years in and this routine has become all encompassing – as well as costly – for Madame Loan. Part saviour and part hoarder, she has amassed a staggering assortment of 60 dogs at her home. To pay for an array of animal food, medicine, vaccinations and surgeries for the animals in her care, she’s resorted to selling off her jewellery and a variety of household goods. In addition to her financial worries, Madame Loan also has mounting personal costs. She herself has undergone a series of surgeries that slow her movements, evident in the scars behind her knees and a brace on her right leg. Seated on a concrete slab at one of the pagodas, Loan explains how she overlooks her own health needs to save money. “When I am sick I don’t want to go to the doctor because that is money for them,” she says, pulling back the collar of her striped shirt to reveal a puncture wound on her neck. “The dogs [sometimes] bite me when I try to stop them from fighting in the streets,” she continues, revealing more flesh wounds on her left leg that also have yet to heal. As a possible explanation for the extent to which Madame Loan sacrifices herself to help animals, Boyd Bergeson, 32, a mental health counsellor in Phnom Penh, says that although he has never met Loan, her experiences are textbook examples for an obsessive compulsive disorder. “OCD preoccupies your day-to-day activities and your thinking and that can be a very hard addiction to break,” says Bergeson, who explains that the symptoms of OCD are similar to those suffered by chronic gamblers and drug addicts. “They get a psychological reward and a sense of fulfilment by helping dogs get better,” he adds, stating that some people are compelled to keep dogs to a point that it becomes problematic for their own health, personal relationships and wallets. Despite these warning signs, there is a paradox whereby Madame Loan’s efforts are benefiting the community and arguably serving a larger purpose. “I think that [taking in dogs] is a great thing,” says Bergeson, “but she should try to set herself a limit. If you are obsessed with dogs that would be the way to do it properly.” Loan is aware that her work can seem a little excessive to most people. Jan Chantrasook, one of her close friends, reveals that Loan has been branded crazy in the past but defends her as a passionate animal lover. Aided by three housekeepers and a 20-year-old daughter, the last of seven siblings who has yet to move out, Loan’s home is remarkably clean despite the abundance of four-legged traffic. Inside the kitchen she offers a glass of cold water and we stand next to a large plastic bowl that contains three small turtles she also rescued. Outside are the sounds of a rooster she saved during Khmer New Year. “I give food to the mice too,” she says with enthusiasm. Before meeting some of her other dogs that are spread among two other gated compounds, Loan shows me an upstairs bedroom that has been converted into an animal sickbay, complete with a fully stocked medicine cabinet and eight drawers that contain a mix of dog clothes and blankets. For the meantime, she refuses to place a limitation on the number of animals she cares for. “My husband says stop but I cannot. They will die,” she says bluntly, expressing no interest in joining the workforce again. “If I work, who will take care of them?” she asks, raising a very reasonable question.